Hest, L. (1997). When Jessie came across the sea. New York, NY: Scholastic. Genre: Informational book, with fictional people in real situations. 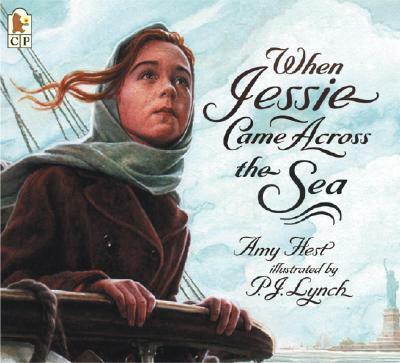 Book Summary: When the rabbi in Jessie’s town chooses 13-year-old Jessie to make the voyage to America, she is anxious, afraid, and unsure of what her future will be without the comfort of living with her grandmother and their village. But, she has some skill with a needle and making lace, and she has kind people to take her in once in New York. Jessie works hard for several years, sewing and making lace, developing a following for her bridal dresses, and is able to save up enough money to bring Grandmother to America to live with her. Impressions: This was one of my favorites. I suppose I’m a sucker for 18th-century immigrant stories, but I ended up tearing up at the end when Jessie sends for her grandmother. I thought the art was gorgeous, and I appreciated that Lynch’s illustrations felt realistic and not clean it up. I also thought that the writing worked together to capture the European immigrant experience. Brown, J. M. & Roback, D. (1997). When Jessie came across the sea. Publisher’s Weekly. 244 (44). Retrieved from: https://www.publishersweekly.com/978-0-7636-0094-5. Library Uses: This one would be good on a library display or a storytime for older children about immigration and the different stories of immigrants. Readalikes: I tried to pick more contemporary, diverse books, since that is the current state of immigration today. Islandborn by Junot Díaz, illustrated by Leo Espinosa – The story of a second generation American, and her realization that her Cuban heritage and family heritage are as much a part of who she is as her American-ness is. Mama’s Nightingale by Edwidge Danticat, illustrated by Leslie Staub – The main character, Saya’s, mother is sent to an immigration detention center. Her mother takes to sending Saya Hatian tales through cassette tape from the detention center, and Saya is inspired to write her own story of hope.